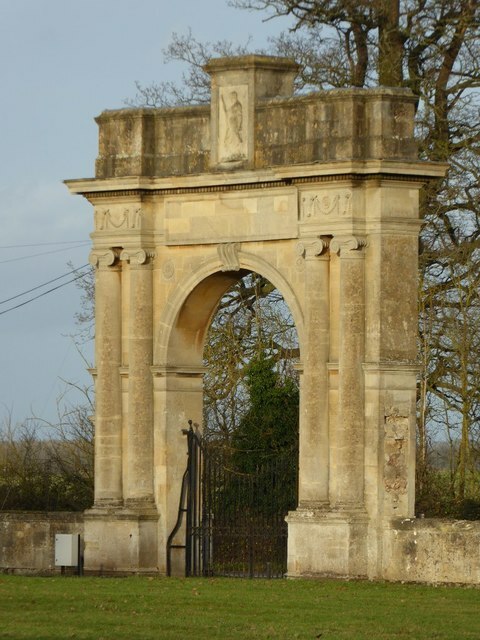 The Pershore Gate is also known as the London Arch and is the east entrance to Croome Park, here it is viewed from inside the parkland, though the land immediately inside the gate is private and not open to the public. The arch was designed by Robert Adam in 1779, it possibly is based on the Roman Arch in Pula which Adam saw in 1757, though it is more likely to be inspired by the Temple of the Sun at Palmyra. The arch and its lodge are Grade I listed. Lodge and arched entrance gate to Croome Court. Possibly c.1760 by Robert Adam and altered by Wyatt c.1800. Bath stone ashlar. LODGE small 2 storey with hipped low pitch slate roof and 2 paired stone stacks on West front. East front has projected pedimented centre with blank panel above and glazing bar sash window below string course. String course continued across side bays. West front has arched central doorway, rusticated piers, moulded imposts and keystone. Glazing bar sash windows to each floor, each side. 6 panel door. On South end wall a plaque inscribed 'Rebuilt 1877'. GATEWAY, a thin triumphal arch of Palmyra type with coupled Ionic columns each side supporting projecting entablature sections with dentil cornice and ox-head and patera decoration to frieze. Central arch, console keystone and paterae in spandrels. Blank large oblong panel in frieze above. Parapet over with central raised panel formerly with relief of 'Day'. Rear similar but with relief of 'Night' in top panel. To each side low WALLS with end piers surmounted by Coade stone urns. iron railings removed.